Vignan's Group of Institutions, Guntur has advertised in THE EENADU newspaper for recruitment of Professor, Associate Professor, Assistant Professor jobs vacancies. 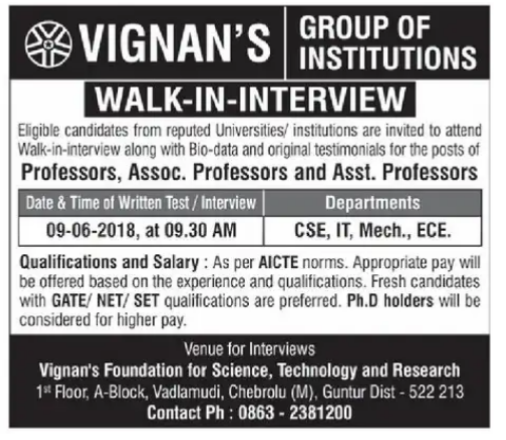 Interested and eligible job aspirants are requested to interview on 09.06.2018.Check out further more details below. How to apply: Interested and eligible candidates can attend date and time interview:09.06.2018 from 9. 30am onwards. Venue:Vignan's foundation for science, Technology and Research, 1st floor,A block,Vadlamudi, Chebrolu, Guntur.